We are now offering gift certificates for our customers. Gift certificates are available in $20, $30, $40, $50 and $70 USD. You may choose to receive the gift certificate by email or regular mail. If you would like to receive the certificate by e-mail, please indicate it in the ordering instructions with the recipient!|s email address. We will e-mail the gift certificate to you and the recipient, so that both of you have a copy. If you don't request an e-mailed gift certificate, we will mail it to your shipping address via first class mail. There!|s no shipping charge if you only purchase gift certificates. The recipient of the gift certificate must have email and access to the internet in order to receive and use the gift certificate. 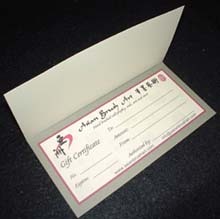 Asian Brush Art Gift Certificates can only be used for 6 months from the date of issue. The gift certificates can only be used for purchases on our website. They are not refundable and not redeemable for cash. 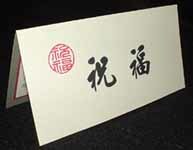 The certificates are only valid with the signature of the calligrapher and signature seal stamped. Any unused balance will remain available for future purchases under the same gift certificate number up to 6 months from the original date of issue.